There’s a very distinct (and at times, quite large) difference between what I enjoy and what constitutes a good course. Usually, those courses are worth of being as highly ranked as they are. However, does that mean that some of them were my favorite courses to play? The fun thing about this list, is that I get to decide what get’s ranked where, and why. As much as possible I tried to throw out exclusivity and pedigree. For instance in all honesty, if you told me I could go play Tobacco Road or Oakland Hills – I’d probably still choose Oakland Hills – yet I have Tobacco Road ranked higher. Now that you understand a bit about my unconventional ranking strategy, let’s get on with it. Here are my personal 50 favorite (note: not the best), courses in the world. The public side of the 36 hole property, Ghost Creek is one of those courses I could play day in and day out. While there are a few pedestrian holes, the majority stand out – especially #3, 6, 9, 16, and 17. When it comes to public golf in Portland, this is as good as it gets. Remember how I said there are more enjoyable courses in the area than #2? Frankly, I found #8 to be more fun and more enjoyable than it’s historic big brother. Fun holes and elevation changes make this a solid, and more affordable option on a trip to NC. While I was living in Bali in 2011 I had the opportunity to play this course twice, and unfortunately I only remember bits and pieces of the course – as this was before my golf obsession really hit. I’ll make it back there one of these days, and if so, there’s a good chance it’s ranking could climb. Another surprising one for many of you I bet. This a great example of a course where if given the opportunity, I’d choose to play here again over some of the courses I’ve ranked higher. It’s a very difficult course, with great difficulty and par 3s that while enjoyable, are a bit repetitive. Forest Dunes is in the middle of nowhere. But the Weiskopf layout is worth the trip. It’s in a beautiful region of the country, and you can get some awesome stay and play deals in the fall. The draw is also only strengthening with the opening of their new reversible Doak layout set to open in the next year or two. The exact opposite of Pronghorn, Tetherow is one of the most unique courses in the world. It’s in the high desert, but the fescue grass has it playing like a links course. It’s extremely high on the fun factor, and the greens can leave you some truly terrifying putts. This is one that with another round, I might rank considerably higher. The Lake Course is one of the most difficult courses I’ve played, but it’s always one where I enjoy getting beat up. There are some great views of San Francisco (assuming you get a clear day), and the history of the club is fantastic. One of the busiest and coolest locker rooms I’ve seen as well. Playing Atlantic was truly something special, as it’s one of the most exclusive (and expensive!) courses in the country. We had the whole course to ourselves and it truly was an enjoyable day. But I found the Rees Jones design to get a little bit repetitive at times – and will definitely beat you up if you’re not on your game. For a course perennially ranked in the top 20 in the world, I was expecting to like it much more than I did. Don’t get me wrong, it’s still a phenomenal course, but compared to some of the other courses I played on my Scottish road trip – it didn’t do as much for me. Very excited to see the changes Trump makes to 9, 10, and 11. Spyglass may very well have the best opening 5 holes in golf – or at least close to it. However, once we turned the corner on 6 things went downhill for me. There were still highlights of course, but it all felt like a bit of a letdown after such a phenomenal start. Not to mention it’ll beat you up, and you pay a fortune to have it do so. Coore and Crenshaw are probably my favorite modern designers, and I look forward to hopefully playing many more of their courses in the future. Dormie Club was originally supposed to be a very exclusive private club, but the recession threw a wrench in those plans. Their loss is the public’s gain – I’d take this over Pinehurst #2 8 times out of 10. Home of this year’s Barclays, Plainfield is a fantastic Donald Ross layout. It starts to border on the “long, championship style” courses that aren’t always my favorite, but I really enjoyed my round out here – especially the back nine. This is like the Six Flags of golf courses. Up, down, left, right – you won’t find many courses for just flat out fun and unique experience. You pretty much have to take a cart, and you’ll play holes that while not always the most strategic, may very well give you vertigo. This is one of those “must play at least once” type courses. There aren’t many major tournaments Oakland Hills hasn’t hosted. This struck a better balance of difficulty and hole variety, than say Medinah or Olympic – and the greens are some of the slickest and most difficult I’ve putted on. Speaking of brutal walks, this might have been the longest, toughest, most difficult walk of my life. – partially due to the torrential wind and rain, I’m sure. I was surprised by just how good Trump’s course here really was. It had a modern take on links golf that kept things interesting and fun, even if I thought my lungs were going to give out at times. Host of the 2017 US Open, Erin Hills is another very difficult walk, and the course, which can be stretched out to over 8,000 yards is no slouch either. Another course with excellent stay and play deals, if you live in the midwest, this is a must play. I’ve never been to Ireland, but I feel like this might be as close as I’ve been. I usually play Crosswater a few times a year, and love it every time. It has a solid variety of holes, forcing you to be very strategic at times (4th hole with extremely shallow green), and to flat out bomb it at others (687 yard par 5, 12th). While I do wish there were a bit more elevation at times, this is a must play when visiting Central Oregon. Another one that you might expect to be higher. I love Bandon and I love Pacific Dunes, but having played the course 3 times now I just don’t love it as much as many other people do – as much as I wish I did. I may be slightly biased on this one, considering it’s my home course – but the setting and variety here is absolutely stunning. The par 5 14th is one of the best short par 5s in the world, and while it may not have the length to host a modern day US Open, it’s a course that can still challenge some of the best players in the world. The Fazio course at Pronghorn gets very little play, and as such is in immaculate condition. It’s views of the Three Sisters mountains are unparalleled, and the par 3 8th over an ancient lava tube is one of the best and most unique par 3s you’ll ever play. The only course I like more than Witch Hollow in Portland is Waverley, which is situated on the banks of the Willamette, and is Portland’s most exclusive club. The recent renovation done by Gil Hanse, has made the course so much better and is worthy of a higher ranking on most lists I’ve seen. I also think this course suits my game well, as bunker placement isn’t much trouble for pros and is extra penal for higher handicaps. For me as an 8-1o handicap, I found them to be in the perfect positions to make me think about each of my shots. Full Recap: Is Waverley Country Club the Best Private Course in Portland? When I played Kingsbarns the Scottish fog was out in full force (as were the flashing read guidance lights) – but that didn’t keep me from immensely enjoying the course. Kyle Phillips did a tremendous job of blending old and new, and making a course that’s one of the most fun and enjoyable anywhere. This was another huge surprise. It was my first Mackenzie course, and is another one Golf Digest didn’t have ranked highly. While there may be a few pedestrian holes, more often than not the course is world class with some of the best bunkering I’ve ever seen. 16 is easily one of the top 5 green complexes I’ve seen. Yes, I said it, I like Arcadia better than Whistling Straits. Whistling Straits is more strategic and demanding, but Arcadia is just a blast to play. Almost every hole has views of Lake Michigan, and while critics will look at holes like 11 and call it a “bobsled course” – that doesn’t change the fact that for the average golfer it’s a ton of fun to play. Somerset was a huge surprise for me. When you think of Tillinghast you think of ball busting courses like Bethpage Black. Somerset is much more subdued and friendly – and I loved it. From the beautiful and severe #2 redan hole, I was hooked. Thank you Tim, Alex, and John for one of my best golf days of the year! My Boston whirlwind was fun because we got to play 4 of the best courses in the city: Essex County, Myopia, Boston, and The Country Club. Everyone we talked to had a different opinion on how these ranked. I knew I would love Boston. I like modern course designs, and Hanse did an incredible job crafting memorable and strategic holes. Often overlooked by many on Scotland trips in favor for Open Rota courses, North Berwick is one that should never be missed. It’s home to the original (and best I’ve played) redan green, and at just over 6400 yards won’t scare anyone with it’s length. In my previous top 25 list, Bandon Trails was the outright winner. Which many have been shocked by as traditionally it’s the lowest ranked of the four courses at Bandon. My rationale? It’s the most unique. Narrowing this list down to 50 was extremely difficult, and if I were to go back and reorder them right now there would probably be some changes. But here are some courses that are very good, but didn’t quite make the cut. 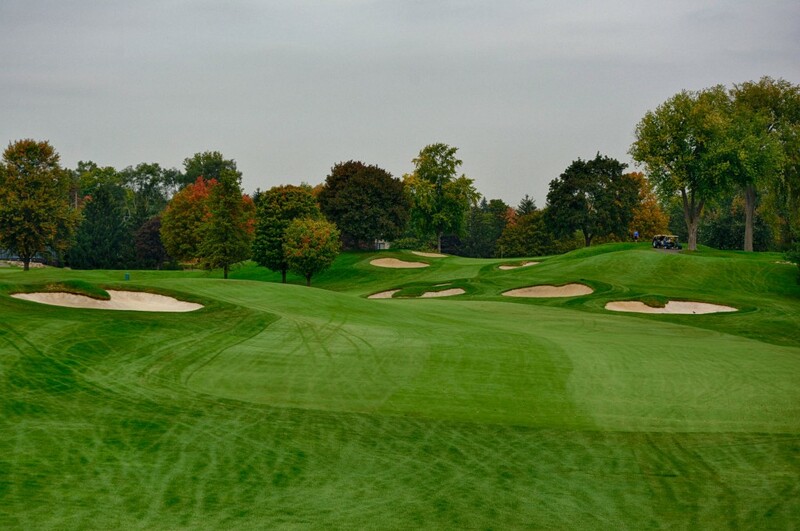 Cog Hill #4 – A very difficult public track, that paved the way for high end public golf. Kaluhyat – This was originally in the top 50, but barely got bumped out after my most recent Boston trip. Essex County Club – A ton of history, and a fantastic back 9. With another play, I bet I’d have this in the top 50. Blackwolf Run (Meadow Valleys) – A very fun course and not to be missed on any Kohler trip. Coeur d’Alene Resort – One of the most unique golf experiences you can have. From the pre-round massage, to the heated cart seats, to the famous island green – you’ll remember this round for a long time. So, with that, what courses aren’t on this list that you think I should go play? What’s your #1 course? Jason, thanks for the comment! When I was in Scotland, the Old Course was closed for the annual R&A meeting, so I didn’t get a chance to play it. I did play The New Course, but it wasn’t my favorite. Somerset is incredible, and while yes Blackwolf is spendy, I found it to be an incredibly fun golf course. It’s also quite embarrassing to say that I haven’t yet played Eugene CC. I grew up in Eugene AND my sister used to work there. But hopefully going to make it happen very soon, I actually know a handful of members, just a matter of setting up time to do it. Will definitely be updating each year! I almost played Meadow Club on my last trip down there, but went to Pasa instead. I’ve been working hard to get on MPCC, but it’s been tough with the reno on the other course…hopefully soon! Chambers Bay! Love the way the ball moves if you hit it in the right spots! Old course and Teet of the Dog (Pebble Beach of the Dominican Repulbic) round out my top 3. My buddy just played Teeth of the Dog on his honeymoon, looked unreal. Punta Espada in Domincan Republic Is also a must play and one of best courses in the Caribbean. It rivals Teeth of the Dog and in many ways it was a more enjoyable round in my humble opinion. Love your ranking criteria! Golf needs more of these kinds of ranking lists, (based on FUN–what a novel concept!) as opposed to the same ol’ boring list of uppity private clubs by snooty scratch players and architecture buffs who concern themselves as much with pedigree as how much the holes make them smile. Appreciate your rationale behind each course too. I know places like Tobacco Road often get panned on serious course sites, but it’s not easy to find a course that’s more fun. I gotta know… where, when, and how do you get the time/money/access to play all these places?! A few recommendations from my neck of the woods that might make your Top 50: Scotland Run in Williamstown NJ (dug out of an old sand quarry), Atlantic City CC (George Crump’s original home club, on the bay with great greens), Twisted Dune in Egg Harbor Township NJ, Glen Mills GC in Glen Mills PA, Sand Barrens in Cape May Courthouse NJ, and Pine Barrens in Jackson NJ (a dead ringer for Pine Valley). Totally agree. Don’t get me wrong, I have a full appreciation for history and architecture. Thats why I said if I were rating for a major publication I’d do it very differently. But golf is supposed to be fun, so why not rank the courses that way? Great list. Almost played Atlantic City CC last month, but just didnt quite work. Will check those out whenever I’m in the area! Good list. Get yourself down here to Melbourne so you can add a few of the sandbelt course onto this. Great list. Played several of these, and wasn’t disappointed by any of them. If I had an opposing viewpoint, it would be on The Straights course. While the par 3’s are without a doubt the best collection of 3’s of any course I’ve played, I felt like I was taking a beating both times I played it. Thought the fairways were a little unfair in places…although Jason Day wouldn’t think that I’m sure. For me, the “fun factor” wasn’t as great as say Erin Hills. For those reasons, I probably wouldn’t have this course ranked quite as high. I’m splitting hairs though. Still an unbelievable course/experience. As always…love your site. Love the reviews. Keep up the good work. Yeah that’s one I waffle on a bit. Definitely a unique and difficult course, but I could see why you think it could be unfair. In 100% agreement with the above: How have you found the time and money to play all of these in the past couple of years? It’s staggering. Your site is awesome, and I always enjoy your articles and especially the photos – post more! My biggest two courses (in the U.S. – I can’t see getting to any other countries now that I’m close to getting married) that I want to play are in Idaho and North Carolina because of your site. Also… I enjoy your criteria of “Fun” for rankings – that’s how I like to rank them, too. I’m a 9 handicap (index), and even though I play over 100 rounds per year I know I’ll never be scratch (I love playing too much to care enough! ), but with all the great courses I play I just want them to be fun for guys like us who are always trying to get close to, or break, eighty. Thanks for the post Paul, really appreciate it! Really, really good stuff here. I always enjoy reading your perspective on your travels. I’m truly envious of your golfing roster. We need to get you out to Philly in 2016 though. Just way too many good ones that you need to play and add to this list. I’m really curious where you would put Merion on here. No Florida curses? Great white at trump Doral is a Greg Norman design, it is very fun to play. Streamsong in central Florida! Thank you for a great year of reviews and breathtaking pictures! Enjoyed the list and love checkin up on this site from time to time. Its always nice to read a top 50 list based on someones perspective of enjoyment of play apposed to a list thats driven by money and prestige. Where are the reviews on your Boston trip? I live in the boston area and have played many courses in the area but have yet to get out to Boston GC or The Country Club. Ive heard great things about both and they are both on my bucket list for the area. Had the chance to play Cabot Links and Cabot Cliffs in Nova Scotia in August this past summer. The Cliffs course really lived up to the hype and will be something special for years to come once it matures. Its quite remote but worth the trip. Keep up the good work! Pete Dye Golf Club should be on every list and it is just not your’s. I like your Top 50 list, Sean, because it puts the emphasis on interesting design and fun to play. My #1 would probably be Hudson, but you make a good case for Pebble. Of course, I disagree with some on your list, and would love to discuss them with you over a round. A few I’d urge you to reconsider or play as I think they belong on your top 50 list include: Shinecock Hills (NY), Fisher’s Island (NY), Baltusrol (NJ), Shoal Creek (AL), The Golf Club (OH), Moonlight Basin (MT), Whisper Rock (AZ), Riviera (CA), and Royal County Down (NI). Sorry I’m late to the party but I wanted to get your opinion on the best course I’ve played. Paa ko ridge just out of Albuquerque New Mexico. I’ve only played about 15 courses and they have all been here in New Mexico but I was wondering how paa ko stacked up if at all. Have you played Riviera yet? I’m sure if it had bent grass greens and Santa Ana fairways it’d be much higher rated by the “experts”. Not yet, still waiting for that invite! Great blog, and I love the Instagram photos! I see a distinct lack of Canada in the top 50 ‘fun’ courses. I strongly encourage a trip up here. If you like unique courses, which it appears you do, try to play Muskoka Bay – it’s always in amazing shape and extremely unique with the rock from the Canadian Shield all throughout the course. Of course we have other, more historic courses spread throughout the country but if you like fun, this is the place. 1) there are a ton of NY area courses that you haven’t listed that you absolutely should. The obvious ones to me are Shinnecock, National, Winged Foot, Baltusrol, Fishers Island and Friars Head. Know those are all tough to swing but you gotta do it! My favorite of these is Winged Foot West and Shinnecock. The day experience at National is second to none. 2) I also think that while you have done a little north Carolina that you’ve got some ground to cover in the Southeast. I think Georgia in particular is about as good as it gets even if you exclude The Big One. Between Peachtree GC, Eastlake, Ocean Forest, Sea Island Seaside Course, Frederica (Sea Island) and some others, there is a big slug of top 100s to try. On top of that there are the obvious big dawgs. Alabama and Tennessee have some incredible golf as well – just a lot of southern golf tradition that should definitely be experienced, based a lot on the excellence and camaraderie of Bobby Jones and RTJ. I’m from Northern Califonia originally and lived in NYC for about a decade until recently moving to Atlanta – and you’ve nailed NorCal with a couple of exceptions. If you need help at MPCC or some of the NYC and/or southern courses I’m more than happy to help. Great list. Love the focus on the fun factor. Totally agree with you about Bandon Dunes and Bandon Trails over Pacific Dunes. Just played them all a few weeks back. Would love to get back to OR and see if I can get on Pumpkin and Pronghorn. My favorite courses not on your list are Sand Hills, Ballyneal, Pine Valley, Cypress Point, Kiawah Ocean Course, and St Andrews Old Course. All totally have the fun factor. My targets are Crystal Downs, Fishers Island, National Golf Links, and Shinnecock. Keep up the great work and great photos. Good luck hitting all top 100! You need to come out to Nebraska and play some of the Sand Hills Courses!!! 1. The Prairie Club. 2. Sand Hills. 3. Dismal River. 4. Bayside. 5. Wildhorse. Sean strong left coast bias, but that is fine. I do like your list and played most of them. My 2 somewhat off the grid would be Yeamans Hall and Teugega! Great list. I’ve been fortunate to play a few of these and would also be on my “Breaking 80” list. A buddy just sent me a link to your review of the Dormie Club as we are planning to play it this fall. I have fallen in love with Coore/Crenshaw tracks (Bandon Trails my first). You absolutely have to put Cabot Cliffs on your list. It has really only been officially open for one season, so it still has some maturing to do, but it is already worthy of a top spot on your list. Of course, I’m a bit biased as I grew up in Nova Scotia, but despite all the hype, I have yet to hear anyone who has been disappointed. It’s sister course, a few years older, Cabot Links is also incredible. Many say its a long way to travel …but similar to Bandon Dunes, it is well worth the journey. The friendly folks and surrounding scenery, if you have time to explore the Cabot Trail, make it a great trip for non-golfing spouses as well. There are other courses on Cape Breton Island that are fun to play if you make the time. You are most likely to enjoy the best weather in July through September. A really fascinating list. I wonder if by now you have been played in Wales or Ireland? I am Welsh with Irish mother but live in the north west of England with both Birkdale and Luther close by. I haven’t played either but went to see Mark O’Meara’s Open in 97 at Birkdalr and David Duvall’s at Lytham in 01. I much preferred Lytham…Also close to home here is The Cavendish, one of Alastair MacKenzie’s designs before he went to the US. I’m also lucky enough to have played the old course at Sunningdale just outside London which was amazing. In Wales we have two Royal courses, Porthcawl in the south where I grew up and St David’s in Harlech in the north. Close to Porthcawl are Southerndown where I was a junior and Pyle & Cynffig, both very different. Where do we start in Ireland? I’ve never played in Kerry, or Jack’s Mount Julliett or Arnie’s K Club but both Portmarnock courses and Royal County Down are amazing. And if you ever get to Mallorca, head to the Marriott San Antony near Llucmajor has two lovely courses. I’m hoping to get some golf played in Madrid soon. But I always come back to my home course of High Leigh Park, just outside Warrington in Cheshire where I live. The Ryder Cup captain Mark James – from infamous Brookline – had a hand in the design and Charle Schwartel and Louis Oousthizen have both played there and it is still a delight that I love playing… I think you can play most holes three or four different ways. Sean, you’ve got to come to Georgia and play Reynolds Lake Oconee golf courses, specifically Great Waters – a Jack Nicklaus course. We have six courses at Reynolds and two other greats, Cuscowilla and Harbor Club, all within 15-20 minute drive from each other. Architecture by Bob Cupp, Tom Fazio, Rees Jones, Jim Engh, Jack Nicklaus, Weiskopf-Morrish, Crenshaw and Coore leaves little to be desired. The second largest lake in Georgia is surrounded by all these beautiful courses and a gorgeous Ritz Carlton Lodge is tucked away in the perfect spot on the lake! Well worth your time… and if you want to explore living here or a second home (as many do after their visit), I can help you with your search. Great job on the blog! BTW, my 14 year old son just broke 80. Great list – thrilled to see your review of Dornoch – one of my top-5 as well. Cruden Bay is also a gem I’ve played & loved and Trump Aberdeen was every bit the brute you described. Now you have me hooked on going back to play Berwick . – in UK – Found a little gem out near Wales off of the M4 called BoWood – lots of good stories from there and a nice parkland track in exceptional condition.